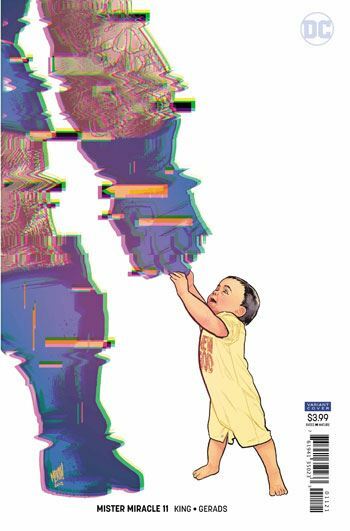 Baby Miracle meets granddaddy Darkseid. Mama Barda and Papa Miracle attempt to trick granddaddy Darkseid into not taking Baby Miracle forever. 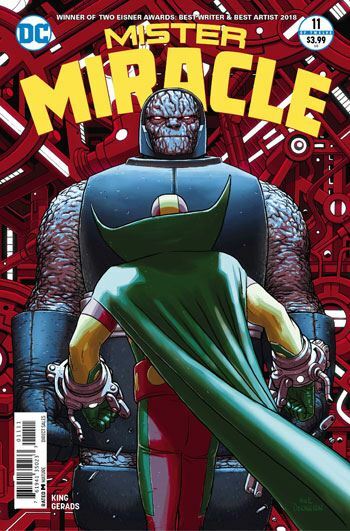 Can Mama Barda and Papa Miracle pull the greatest heist of all time? This issue has been anticipated for a while. Darkseid has been in this series from day one but barely seen, just hinted at. He has been a thorn in Scott Free and Big Barda’s lives for over a year and they have finally decided to confront him this issue. Throughout all of their confrontation with Darkseid, they continue to jest and find humour where there should not be. It is the lighter talk between the two of them that makes this series so great and show how they truly love one another. As cliché as it seems, the revelation at the end of the issue took me by surprise. I was expecting another twist not the one that Tom King showed us. This issue definitely makes me want to read the next one. Mitch Gerads plays his part as usual, making this comic the best on the market right now. For someone who is not a natural at the super hero genre, he handled himself quite well here. Pay attention to the way he draws Darkseid in the nine-panel grid. There is a lot of secondary storytelling hidden in these scenes.